We humans are getting pretty good at creating technologies that extend our sense of hearing. We are still playing catch-up with bat technology though. 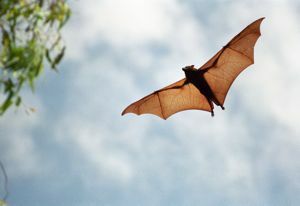 Bats are able to pluck a moth out of the air at high speed in complete darkness. Everyone knows bats 'see' by sending out high pitched sounds and listening for echoes returning from their prey - echolocation - but is it as straightforward as that? In particular, why do bats go to great lengths to make sure they can't hear themselves speak? Bats somehow manage to turn the stream of echo information they hear into a mental image of the world around that is detailed enough to take action. They do it brilliantly, even working out not just where their prey is but what it is too. There is a more mundane problem bat evolution had to overcome first, before dealing with such sophisticated issues, though. How does a bat you stop itself being deafened by its own shrill squeaks while listening out for those much quieter returning echoes? Many bats deal with the deafening problem by physically closing their ears as they make the shrieks. That raises a new problem of how they hear the echoes when they aren't actually listening. They get round that by sending lots of very short pulses of sound, listening for the echoes in the gaps. Another way has evolved in a different family of bats that is a little more sophisticated. Rather than separating their shrieks and the echoes in time they separate them by pitch. These bats send out a continuous sound and rather than closing their ears, listen constantly. Their ears are instead tuned very finely to particular frequencies - just the ones of the echoes not the frequency of the original shrieks. Just as we aren't deafened by bat calls as we can't hear them, the bats aren't as they can't hear their own calls either. The original sound is not at a frequency their ears can hear. They can hear the differently echoes though as they have different frequencies. It takes some serious audio engineering to get this kind of echo-location to work though. These bats have to deal with something called the Doppler shift. It is the reason why sirens sound higher pitched as they come towards you than when going away. If an object is moving quickly towards you the sound source catches up a little with the crest of the previous sound wave before sending out the next one. This means the sound waves are bunched closer together than they would be if the sound source wasn't moving. If the wave crests are closer together, then their frequency - how often wave crests reach a person listening - is increased. A listener will hear a different note to that produced. Similarly when an object is moving away from the listener the last wave crest is that bit further away when the next one is emitted. The frequency of the sound is lower as the wave crests reaching the listener are more spread out. A similar thing applies if the listener is moving too. This matters to the bats as they are moving when chasing prey. When they listen for their echoes they are listening for sounds from a moving source as well as being a moving listener which means the echoes can be separated by frequency from the calls. That of course is what allows the system to work in the first place. However, the frequency of the echoes will change as the bats change their speed in flight. That could mean their finely tuned ears won't always hear the echoes. To overcome this they carefully change the sounds they send out to match their speed so the echoes, after the Doppler shift is taken into account, are in exactly the right frequency range to be heard. Bats are thus not only brilliant at hearing but also brilliant at not hearing too. Next time you hear a tape of yourself and decide you don't like the sound of your own voice, think about the bats. They have the perfect solution.